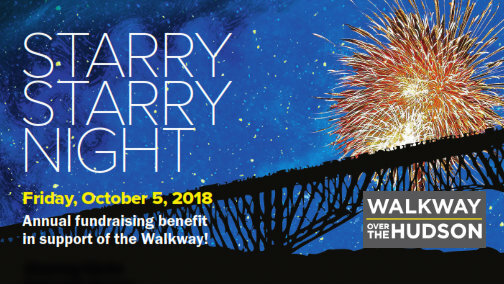 POUGHKEEPSIE, NY—The Walkway Over the Hudson organization will honor four “Great Connectors” when it holds its annual Starry Starry Night benefit on Friday, Oct. 5th at Walkway State Park’s new Ulster Welcome Center. The nonprofit group’s highest measure of appreciation, Great Connectors have worked tirelessly for years to support the organization’s ongoing mission to support and enhance the Walkway Over the Hudson State Park. The Starry Starry Night celebration, which serves as one of the Walkway organization’s primary fundraising events, will honor dynamic philanthropists, Michael Fleischer and Michael Dupree of Hyde Park; businessman, technical wizard, and long serving board member, John Storyk of Highland; and quintessential volunteer Ambassador Don Cady. Honorary Co-Chairs for the event are Dr. Lucy Rockefeller Waletzky (Chair of New York State Council of Parks, Recreation and Historic Preservation) and Robert R. Dyson (Chairman and Director of the Dyson Foundation). Funds raised from the event help the nonprofit organization achieve its ongoing mission of supporting and improving the popular New York State park in various ways, such as making capital improvements and building, connecting to the Empire State Trail, developing providing programming for the park’s nearly 500,000 annual visitors, and recruiting the Walkway Volunteer Ambassador corps and hosting unique events. Guests attending the benefit, scheduled from 6-10 p.m., will view a stunning firework display and enjoy delicious food from Chef Charles Fells of Main Street Hospitality paired with acclaimed wines from Millbrook Vineyards & Winery and craft beer from Half Time. Tickets to the event are $175 and a limited number are still available. Visit walkway.org to purchase tickets and preview silent auction items. Major sponsors of the Starry Starry Night Gala include: Entergy, Meyer Contracting Corporation, Royal Carting Service Company, Walkway Board of Directors, Michael Fleischer and Michael Dupree, Health Quest, Natasha and Richard Krupp, and Lucy R. Waletzky MD. Michael and Michael are the epitome of the Great Connector: community leaders, activists for positive change and true philanthropists. Michael Fleischer has served on the Walkway board for five years, both on the Finance Committee and assisting with development. He has made connections to family foundations, community leaders and sponsors. His husband Michael Dupree is a Great Connector in the many worlds he seemingly effortlessly navigates. He served as a Starry Starry Night chairman for several years where he successfully brought new people to the organization, increased our sponsorship level and brought his usual energy and expertise to make the Starry Starry Night a prominent event in the Hudson Valley. John Storyk is a connector in many ways – and one of them is technically connecting people to music and sound and making sure that those connections are the state of the art around the world. John Storyk is now the longest serving board member of Walkway Over the Hudson organization, lending his architectural skills as we drew up designs and worked with State Parks to add amenities and facilities to the Walkway. He has continued to provide expertise, technical assistance, energy, and a good dose of business sensibility to our organization. 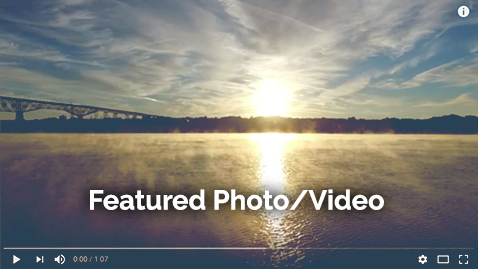 He has been an invaluable resource to the Walkway Over the Hudson as we’ve grown into a successful nonprofit. We are pleased tonight to honor John Storyk as a Great Connector. There is one individual who has connected to more people over the last eight years than any other Walkway staff or volunteer. He has truly worked with joy and gratitude, wearing his red vest whenever he could – greeting guests, sharing history and stories with them, donning Santa’s red suit and lots of pillows for our Santa on the Walkway. He has taken endless pictures, so guests can be in them together and has been an exemplary community connector. As a Korean War veteran, Don has supported veteran activities including the monthly flag changing event. Don Cady has done much to bring Fred Schaeffer‘s vision of Walkway Over the Hudson being the “friendliest park in the world” to fruition.